The Republican Party still controls the House and the Senate. And young African-American athletes still dominate the two most popular pillars of contemporary American culture: the National Football League and the National Basketball Association. What does that mean, moving forward, in a nation that has turned red and is visibly divided? I spoke with Newhouse after the Giants’ practice in preparation for Monday night’s game with the Cincinnati Bengals. Newhouse, a veteran of seven NFL seasons, said that among others, U.S. Sen. Cory Booker has visited the Giants players and discussed issues ranging from social responsibility to mass incarceration to the disenfranchisement of young black men. Newhouse said the players have also talked about a concerted effort to turn the black majority of players into meaningful action. I visited the Giants’ practice a day after Donald J. Trump pulled off a stunning presidential election victory over Hillary Clinton. With so much elation and so much disappointment, I was curious to speak with players about how they processed winning and losing. More than any group, professional athletes have been taught from an early age how to handle devastating defeats and exhilarating victories. I did not ask Newhouse how he voted, though that became clear when he described how it felt to wake up on Wednesday to a Trump presidency. “In the moment, there was a sense of disbelief,” he said. How does a professional athlete process a devastating loss? 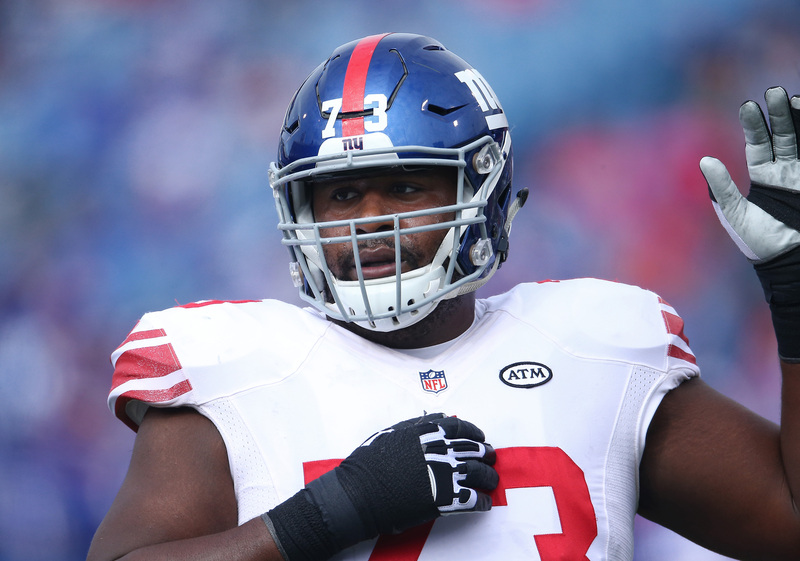 Marshall Newhouse #73 of the New York Giants warms up before the start of NFL game action against the Buffalo Bills at Ralph Wilson Stadium on October 4, 2015 in Orchard Park, New York. I’ve always found the losing locker-room to be more intriguing. The players are more introspective. The losing team, by definition, must do more soul-searching, must ask the tougher questions: Why did we lose? What went wrong? Was it the game plan? The execution of the game plan? What did I do to contribute to the loss? These are questions that must be raised postelection as well. Eli Manning, the Giants quarterback, said he looked beyond the wins and losses. The United States is a divided locker-room. Divided locker-rooms do not win championships and will not be successful until they find a way to find common ground. The best teams, the championship teams, learn to put aside differences and focus on a common goal. That’s easier to accomplish in a locker-room of 70 football players than in a nation of more than 300-plus million people. “Technically, the entire U.S. population is on one team,” Newhouse said, “but you have millions of people with different ways of viewing the world who have different perceptions of what a win and what success looks like. Can the locker-room model be adopted by society at-large? Newhouse says yes. Giants running back Rashad Jennings wasn’t so sure the locker-room model works in the real world. “In the locker-room, we have the same common goal,” Jennings said. “We have less than 70 people in this locker-room, we have the same common goal. You’re talking about millions of people. It’s different. “We collectively as a team are here to win. Everybody individually has their motivations, but at the end of the day, we want to win. We all have the same common goal. It’s kind of easy to rally up when everyone has the same common goal,” Jennings said. What is that elusive common national goal? What constitutes winning for the nation? Women in particular must be asking themselves that question in the wake of a presidential race in which sexism played a defining role in the outcome. This was an election where the metaphor of the men’s locker-room was used to justify boorish behavior. How do we heal? How do we come back from this? And is the role of a leader — a president, a head coach, a team captain — to facilitate the healing process, to pull a divided locker-room together? Manning said he felt progress and healing, learning from a loss, it had to be an individual initiative. 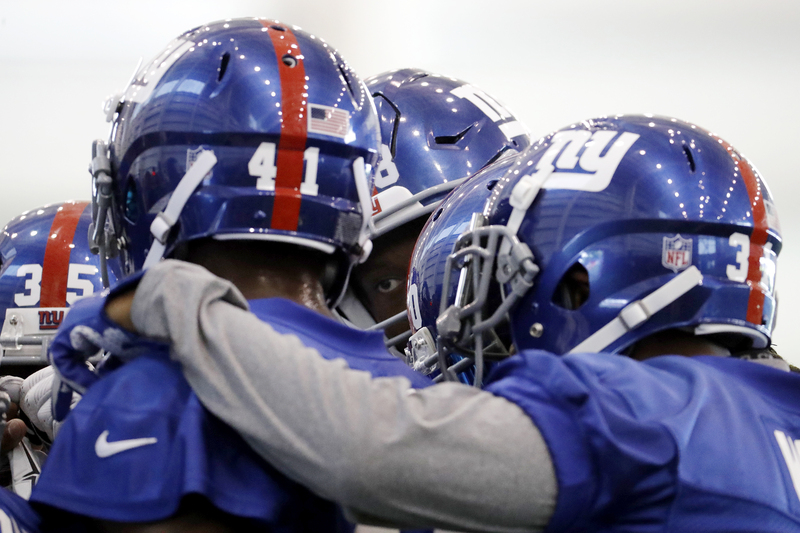 The eye of New York Giants cornerback Eli Apple, center, is seen as he huddles with teammates Matt Smalley (35), Dominique Rodgers-Cromartie (41) and Trevin Wade (31) runs a drill during NFL football training camp, Friday, July 29, 2016, in East Rutherford, N.J.
On Monday night, more than 80,000 fans of all political stripes, Republicans, Democrats, independents, the faithful and the nonfaithful, will converge on METLife Stadium and root for the Giants. For three hours, Trump supporters in their elation, Clinton supporters in their sorrow, will cheer with one voice for their Giants. Will the American locker-room ever heal? Newhouse said that after his initial disappointment over the election results, he went into sports mode and began to look ahead to the next game. Indeed, winning and losing must be tempered.